I’ve been following service desk solutions for several years now – ever since I wrote the first review of Zendesk published in a mainstream blog (disclosure – the Zendesk folks have gone on to become good friends of mine and I also write for their Zengage blog). It seems I lucked upon a real growth area, despite taking these sorts of predictive reports with grain of salt, it is worth mentioning that last year Gartner published a report estimating that by 2012, 10% of the IT service desk market will be made up of SaaS solutions. I was interested then to spend some time talking with NTRglobal the other day. NTRglobal is a ten year veteran of delivering IT automation, system management and remote access to large enterprises. Today they’re launching their own service desk offering, in their case a modular on-demand set of applications aimed at providing asset management and the host of processes that surround it. The central management console itself is, as one would hope from a “true” cloud product, multi everything. Via an RIA the console is multi browser and platform and also includes a number of wizards for either automatic or manual deployment of the agent itself to corporate devices – this can be via LAN, WAN or OTA deployment. SaaS is a no-brainer for this sort of functional area. Asset management is all about providing a central console, and integrating with a number of different systems both inside and outside of the firewall. NTR have been smart taking he modular approach which means that organizations can take a piecemeal approach towards their software stack. 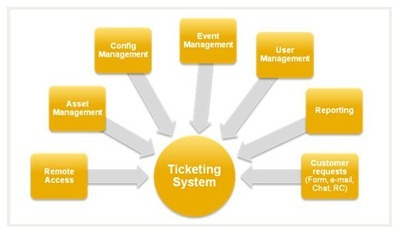 As an example NTR Service Desk integrates with other tools touching IT service management such as salesforce.com and Zendesk, meaning that the asset management components can be tied to he CRM and support ticketing applications the organization uses. While there are definitely some enterprise applications that will be late movers to SaaS. The entire asset management and service desk area is an obvious candidate for a cloud approach. By providing a product very much aimed at larger businesses (over 1000 employees) NTR is likely to hit a market ready for change as their existing tools from BMC and Remedy simply fail to meet their changing requirements. Hi Ben, Thanks for the review. We’d like to give you news about upcoming support for a wide range of mobile devices with NTR Service Desk. Give us a shout!